This is a traditional Moroccan dish and a perfect dinner menu. Couscous variations depends upon our tastes and availability of time. Its a dish inspired from Hamlyn 200 recipes. Heat the olive oil in a saucepan add the onions saute for a few minutes. Add the garlic and all spices and salt, stir together add the chickpeas, tomatoes and the stock. Leave this to simmer over a low heat for 10 min and add chopped coriander and switch off the stove. Put couscous into a bowl and add butter on top cover with salt added boiled water. Uncover the bowl after 5 min and fluff up with a fork. Serve the tagine with couscous and sprinkle over fresh parsley. 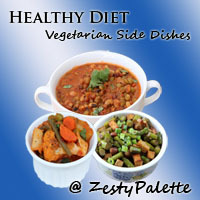 Sending this to Vegetarian side dishes event hosted by Zesty Palette and event by Priyas blog. Omg, wonderful spread, seriously makes me drool..Feel like inviting myself to your place.. 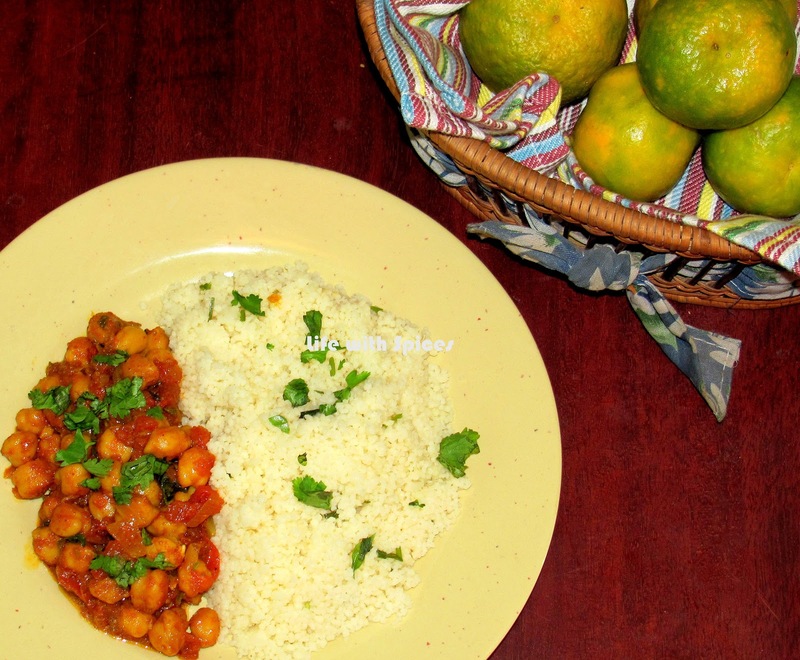 The chickpea and couscous - a nice meal idea. I love tagines- this one looks pretty easy, and I love the couscous, too. What are 6 whistles, though? I never heard of something cooked 6 whistles. LOL. Have a great weekend. I have never tried out couscous...looks light and healthy. Very yummy looking combo. Looks superb. I love coucous. it must have tasted so good with the chick pea curry! 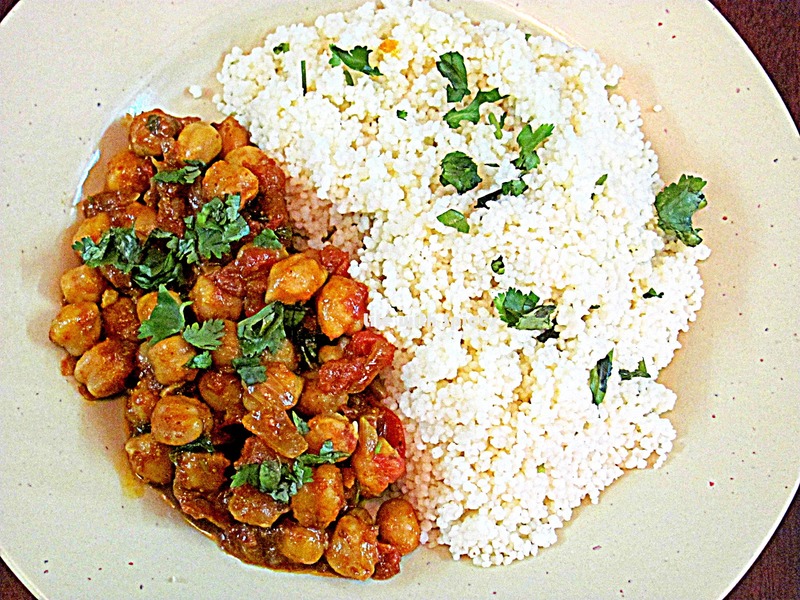 The couscous and the chana looks very inviting..
That looks really sumptuous and healthy! A wonderful meal to have in ones repertoire. Yum! A very delicious ,healthy and new dish to learn..
Moroccan dishes are so quick to make, nice combo of chickpeas with couscous. such a nutritious and healthy meal...thanks for sharing! The tagine is very similar to Indian curries, except the use of olive oil. Pics, especially the second pic, is very nice. Unique recipe, couscous looks so delicious. Scrumptious and healthy meal. You always amaze me! Very nice dinner idea, loved the recipe and combo!